For the last 2 years I have been involved in an Inchy hexagon swap with fellow hexaculturalists from all over the world. Each month I would receive two, 1″ finished sided, hexagon flowers in my choice of colours and patterns. 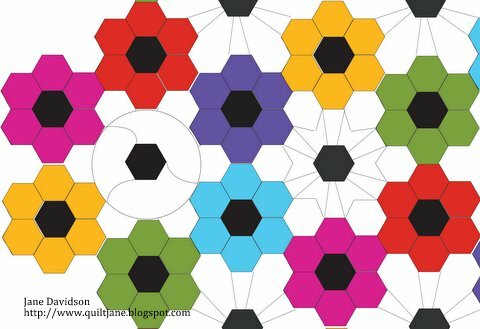 There is a HexyMF Quilt a long going on at Fatquarterly and I have enough to make the beautiful Lillybelle Hexy MF quilt. As usual, I cannot conform to a pattern and decided I should add a betweenie to make it larger. This is my plan. I drew up a few scenarios and decided I liked the ‘exploding hexy’ betweenie the best and made a prototype last night using scraps from my humungous scrap bin (The scrap vomit quilt is definitely on my list of quilts to make). This is not a rug but a poodle as a prop. It will sit between clusters of flowers. I will probably use solids in grey tones with a charcoal centre as the hexagon flowers are quite busy and scrappy. Even though the wedges are small it was not a difficult block to piece. I am working on templates to make it easier to cut and trace. There are many ways to join hexagon flowers. What would you use? « What spooky things will you make for Halloween? that is a great idea to put them together in this way. I have a stash of flowers that I can't decide how to put together. Waiting for inspiration..
Love your choice here Jane. Oh I love it! Hexi's are on my make it some day list. But life is too busy right now. I would put mine together in a non-traditional way, like you did. Cunning plan, takes up more room therefore requiring less flowers, I like it! Your hexies are so fantastic. I love this pattern. Will you share measurements?